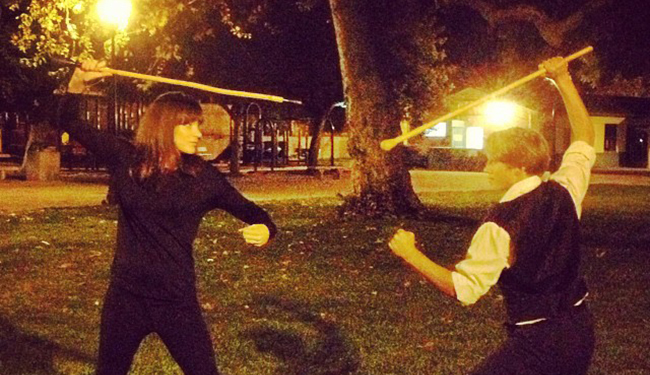 Bartitsu, the Sherlock Holmes art of self-defense, is coming back. It’s sundown at a small park in Burbank and I’m dressed in head-to-toe black, carrying a big stick and ready to street fight, Sherlock Holmes style. I’m not exactly a ninja—the closest I’ve been to hand-to-hand combat was fighting over the last cupcake at Thanksgiving. But even so, I have signed up to learn bartitsu, the esoteric and gentlemanly Victorian art of self defense. Before I chicken out I spot my instructor, Matt Franta, a dapper gentleman in a three-piece suit. Franta’s bio describes him as an actor, fight choreographer, and stunt performer with black belts in tae kwon do and hapkido as well as experience in karate, judo, fencing, and kickboxing. He’s also a member of the International Knife Throwers Association. Bartitsu was developed by Edward Barton-Wright, a British engineer who moved to Japan in 1895. After returning to London, just before the turn of the century, he created a mixed martial art hybrid, combining elements of judo, jujitsu, British boxing, and fighting with a walking stick. The style was promoted to the middle and upper classes during a time when they were becoming increasingly worried about the street gangs and crime publicized by the tabloid newspapers. “In this country we are brought up with the idea that there is no more honourable way of settling a dispute than resorting to Nature's weapons, the fists, and to scorn taking advantage of another man when he is down,” Barton-Wright wrote in an 1899 edition of Pearson’s magazine. Over the next two hours, Franta talks about the history of bartitsu while patiently teaching me the basics of how to throw an opponent off balance with a series of punches, grabs and evasive moves. “It was the first fight style that combined Eastern and Western techniques, and at the time anything from the East was considered very exotic,” he explains. Basically, it’s half historical recreation; half beating the crap out of someone with a cane. I’m beginning to see how this style of fighting would appeal to the fictional detective. 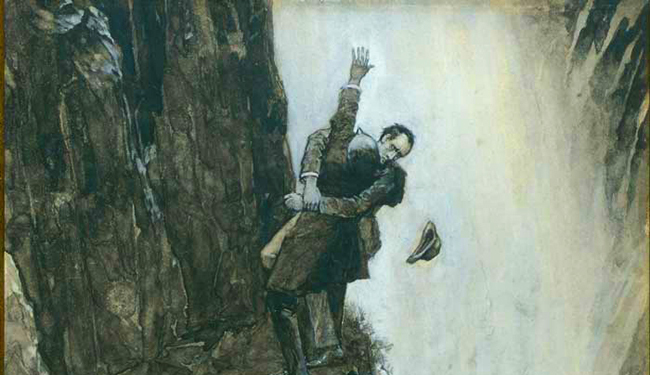 After all, observing and adapting the best techniques to his advantage was one of Holmes’s signature traits. Barton-Wright’s Bartitsu Academy of Arms and Physical Culture was all the rage for fashionable ladies and gentlemen of the era. Franta explains how, behind club walls, they learned to battle “hooligans” from instructors like Professor Pierre Vigny, who honed his technique fighting thugs in shadowy corners. Then, in 1902, the school closed its doors forever under mysterious circumstances. Several theories exist as to what happened: Some blamed Barton-Wright’s high fees; others believe that a badly-managed 1901 exhibition helped seal the club’s fate. The instructors moved on, and so did the general public—and bartitsu was in danger of disappearing forever. “No one knows whether he misspelled it on purpose for copyright reasons, or because a 1900 London Times he may have used for reference has the same typo,” Franta said. Tony Wolf, a fight choreographer, martial arts instructor, and self-described ‘walking bartitsu encyclopedia’, serves as editor of EJMAS: Journal of Manly Arts, a scholarly online journal focusing on the martial arts and combat sports of the Victorian and Edwardian eras. As a founding member of The Bartitsu Society, Wolf explains how he and other members spent years researching and compiling archival material of the era in order to “bring bartitsu back to life” and move it online. “Then we created neo-bartitsu, which is really bartitsu as it might have been,” Wolf says. There is no such thing as an accredited bartitsu instructor, and Wolf says that the group has worked hard to keep the art open-source and apolitical. Each instructor has his own blend of practical self-defense and historical recreation. To disturb the equilibrium of your assailant. To surprise him before he has time to regain his balance and use his strength. If necessary, to subject the joints of any parts of his body, whether neck, shoulder, elbow, wrist, back, knee, ankle, etc. to strains that they are anatomically and mechanically unable to resist. Some of the unarmed combat moves are definitely old school. While modern boxing is known for close body contact, bartitsu boxing is a throwback to the mid-19th century punching style in which men circled each other in the ring. “The point of bartitsu was to avoid the fight if possible, and get your opponent to walk away rather than do damage,” he adds. However, bartitsu students are taught to close and finish the fight with jujitsu techniques if necessary. “The idea was that you use your opponent’s strengths against them. With the use of surprise,” director Guy Ritchie told Vanity Fair in 2009, explaining how bartitsu was incorporated into the fight choreography of the Sherlock Holmes movies starring Robert Downey, Jr.
“There’s all sorts of locks and chokes and various other techniques used to incapacitate someone. There’s lots of throwing hats at someone’s eyes, and then striking at them, if you can, with a walking stick." The movies helped propel what Wolf calls the “fringe of the fringe” movement into the spotlight, and attract a growing number of women. Bartitsu aficionados come from all walks of life. Some study because they are fascinated with the daring tales of the Jujitsuffragettes, a hard-core group of women who trained in secret and helped protect leaders of the UK women’s right movement prior to World War I. Others are followers of the steampunk movement. Victorian sci-fi influence has shown up everywhere from the Steampunk World’s Fair to the Alexander McQueen runway. But could an anachronistic art really protect me against a modern-day bad guy? Wolf points out that students who hope to use bartitsu for present-day combat should keep in mind that it was originally meant for long-term study. “It's not something that you can pick up in a few classes, particularly if you're more interested in real-world self defense than in historical recreation,” he says. But the classes do teach practical information about body awareness, how to target an opponent’s weak points and escape tactics that could come in handy in any situation. Some instructors, like Professor Mark Donnelly have also posted YouTube videos that show how they have adapted parts of their training by incorporating umbrellas and baseball bats as an alternative to canes. After several days of practicing my moves with the kitchen mop, I sign up for the four-week intro course. One day the skills taught to ladies and gentlemen of an earlier era could help me in a modern day battle for honor and glory. At the very least, the elbow lock move called “A Good Way of Conducting a Person out of a Room” should come in handy with annoying party guests. Catherine Townsend is a journalist and private investigator based in Los Angeles. She is the author of Sleeping Around and writes regularly at The Love Detective.